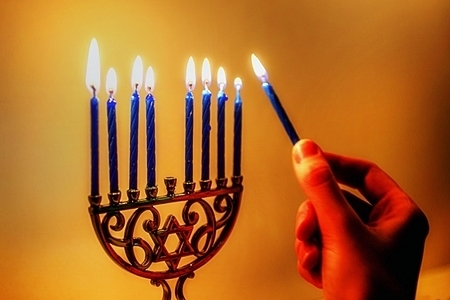 When you think of Hanukkah, do you think of crossing the barrier between the corporeal and spiritual worlds? When you think of the war between the Maccabees and the Greeks, do you think of an inner war within the person, between the desire to love and bestow, and the egoistic desire for personal benefit? When you think of the miracle of Hanukkah, do you think of us being granted an intention to bestow upon our egoistic desire to enjoy? If you do, then you’re thinking in terms of the deeper explanations of the meaning of Hanukkah’s customs and concepts that the wisdom of Kabbalah provides. As a method to discover the higher reality of love, bestowal and positive connection while we’re alive in this world, Kabbalah describes all phenomena in Kabbalistic texts, including all of the Jewish holidays, in terms of a person’s spiritual development. In this infographic, you can get a taste of a few of the deeper meanings behind common Hanukkah customs and concepts, to start perceiving them as inner phenomena and processes each person can encounter from now onward on their spiritual progress to discover the higher reality. As Hanukkah comes to a close, there’s no better time to have a final reflection on the holiday this year from a spiritual perspective. Below you’ll find 7 definitions of Hanukkah terms, as well as links to longer articles where you can get a much deeper perspective on the holiday, sourced in the ancient wisdom of Kabbalah.